Peerless Handcuff Company - Hamburger Woolen Company, Inc.
Peerless® Handcuff Company was established in 1914 in Springfield, Massachusetts. Over ninety years later, the classic swing through design of the original Peerless® handcuff, continues to be the industry standard. 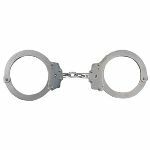 Peerless offers a full line of restraints including chain link handcuffs, hinged handcuffs, oversize handcuffs, leg irons, waist chains and color plated restraints. All Peerless products are designed to meet and exceed the tough U.S. National Institute of Justice standards for strength and quality. All Peerless products are backed by a lifetime warranty for manufacture defects.